Alexander Gibson is a 13 year old attending Year 8 at St Bedes College, Mentone. Coach Sean Williams first met the Gibson family when their youngest son Samuel was in the same class as his daughter Tilly at St Louis’ Aspendale. Now all 5 Gibsons (mum Kerrie, dad Vern, Alexander, Edward aged 11 and Samuel aged 8) run with Melbourne Pack. Clint Perrett was one of Australia’s top distance runners until 5 years ago when injury forced him to hang up his racing flats and take up cycling. He has been on two national senior teams with Sean Williams as team coach. He is an ex St Louis, Aspendale student, with the school cross country trophy named after him. How long have you been training with Melbourne Pack? 2 years; I started when I was training for Cross Country in Grade 6. How old are you, and what are your personal best running times? How many days a week do you normally train with Melbourne Pack? What do you regard as your best race performance? Breaking the U13 1500m Chelsea Little Athletics Centre Record. I have run faster than this on a synthetic track, but I broke this record on the Chelsea grass track on a very hot and windy morning. The conditions weren’t great for trying to break the centre record, but I still broke the record. Which training partners in the Squad tend to push you along most of all? Hudson Bucci and Edward Gibson, as they never give up in training which makes me train harder. Some of the guys that are older then me help to push me as well because they give me someone to chase, Greg Watson, Stuart Capel and Sean Verwey. Other members of your family run. What is it like having such a fit family? I find it good because I’m not the only one being active; we all get out and train together. We even do some fun runs together as a family and sometimes enter as a team. My brother Edward is very competitive and tries to beat me, which he has on a few occasions. 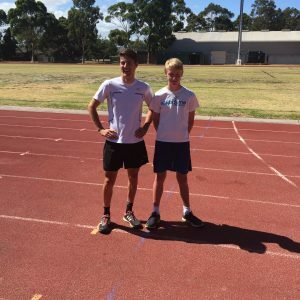 What did it feel like to beat the 22 year old Chelsea Little Athletics 1500m record of Clint Perrett? It was a relief when I found out I had bet the record. I thought I had missed out by a second. I was happy to know I had broken a centre record in my first year of Little Athletics. And knowing that I had broken the record of an athlete that had gone on to run internationally felt like a great achievement. You also recently broke the Chelsea Little Athletics 800m record. Tell us about that race. The week before I narrowly missed the record by less than half a second. I thought this was my last chance at breaking the record, but then found out they were running the same programme at the twilight meet, so I had one last shot. Since I had only just missed the record, I thought that if I really pushed myself I had a good chance of getting it. Dad was cheering me on, and kept telling me to run as fast as I could, I didn’t want to miss out on it this time. I was so relieved when I realised I had bet the record my nearly 3 seconds. What are your running goals for the rest of 2018 and beyond? I ran in the 800m and 1500m at the Little Athletics State Championships in March. There were some top runners there who pushed me along. This was my first big racing weekend. I’ve just ran and won the 800m and 1500m at my school athletics carnival, so I’m hoping to represent St Bedes at the ACC Athletics Championships later in March. In May I will be running the 6km run at the Run the Gap fun run in Halls Gap. Last year I won the U15 event, so I’m hoping to defend my title this year. What was it like to compete at the State Champs? It was my first time in a big competition, as I only jointed Little Aths this season in 2017. I was nervous and unsure about racing at this level, as most of the others kids would have been to the State Champs before or have had more racing experience than me. My first race was the 800m and it was a really hot day. I didn’t get away with a good start, which meant I had to try to make up time during the race. I came 11th and got a 2 second PB, so I was pretty happy with that. The next day I raced the 1500m. There were over 20 boys in the race and I got pushed at the start. I think I need a bit more practice of my starts. It was a hard race and this was my third big race in three days, so I was happy to have come 7th in the state. Usain Bolt, I saw him run at the Nitro Athletics last year, he was amazing to watch. I am very thankful to have Sean as my running coach, as he has trained Olympians and he has helped me so much with my running. I wouldn’t be at this level without his coaching. He has helped our whole family get fit and active.